From time to time, you'll stumble across some quirky little gems in this wonderful hobby of ours. 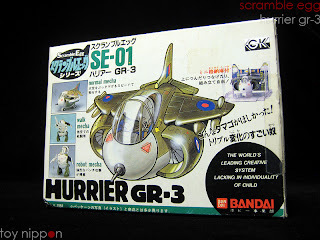 For me, one such gem is the Hurrier GR-3 from Bandai's Scramble Egg series from 1984. Now now, I know it's supposed to be HARRIER, but it's spelled HURRIER on the box, so we'll just go with that. The Scramble Egg series was a short-lived toy effort, with Hurrier GR-3 being the first out of three. 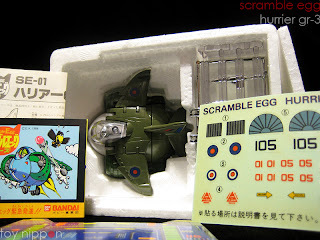 One could argue that the Scramble Eggs were created to compete with Takatoku's ParoMecha Battroid Valkyries since they are very similar in concept, but they could have just been a part of the egg-former craze that Bandai spurred with the release of their Tamagoras line. Along with instructions, catalog, and decal sheet, Hurrier GR-3 comes with a hangar you can build to house it. 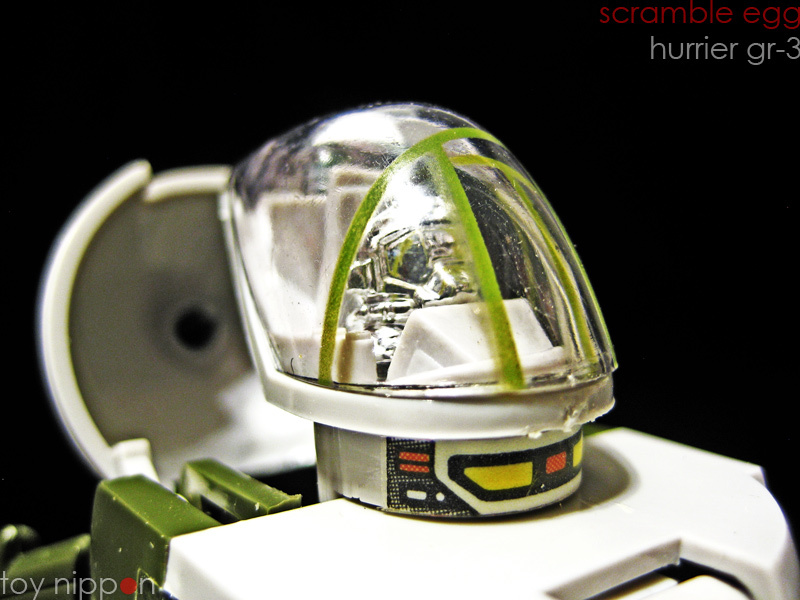 It's great that a display stand is included, but what's even better is that the hangar can stack with the other Scramble Egg hangars to display all 3. The toy itself is, well...the size of an egg! Cute huh? It's made of mostly plastic, but the intakes are made of diecast metal, so you do get some heft. 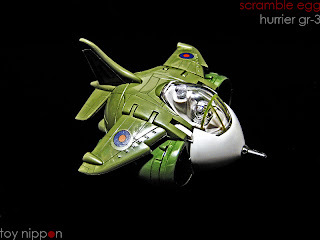 The jet mode does have landing gear that folds out on the bottom and chrome missiles that attach to the bottom of the wings. 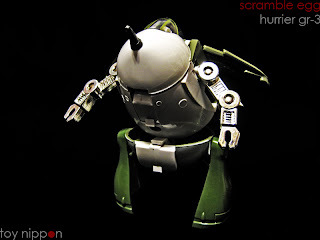 Remember how I mentioned that Bandai may have created these in response to Takataoku's ParoMecha Valks? 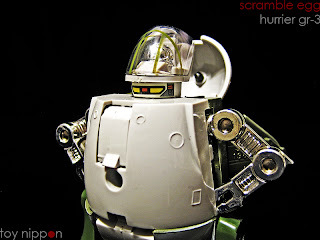 Maybe the inclusion of a gerwalk mode is more evidence for that statement. Even on the box and instructions it's an official mode called "Walk Mecha". It's a weak, half-assed mode, but it's doable. With a simple, yet satisfying transformation, we have the dumpy robot mode. Not a lot of articulation here, but it does have that funky waist action going on with the gerwalk mode, so he can bend over a little. 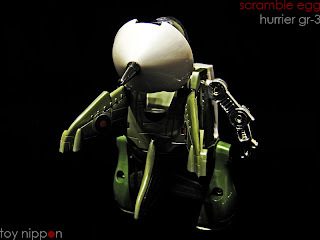 His head doesn't turn, and I think that's unfortunate because it looks like it could have easily been incorporated. 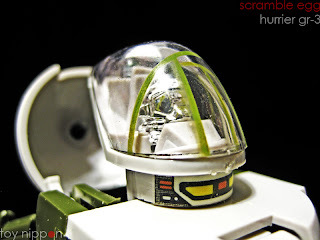 A nice little detail is the cockpit. There's a pilot inside! It's like a tribute to the classic super robot, Mazinger Z. Again, he's the size of an egg with added limbs, so he's smaller than a scout class Transformer. 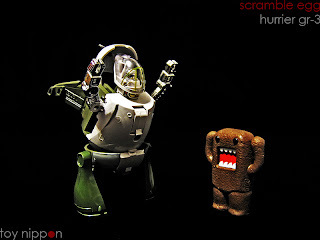 But he towers over a mini Domo-kun! Yep, a quirky little gem indeed. 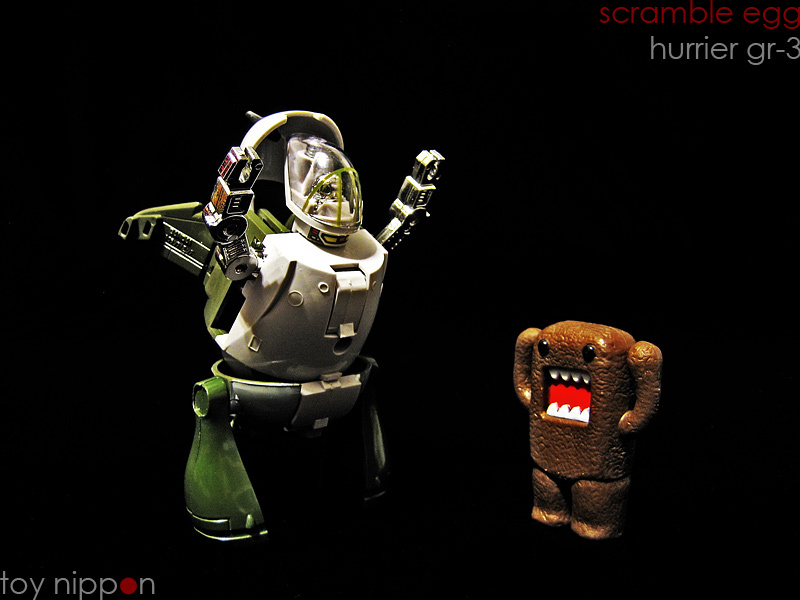 The Scramble Egg Hurrier GR-3 has a lot of personality for a small guy. 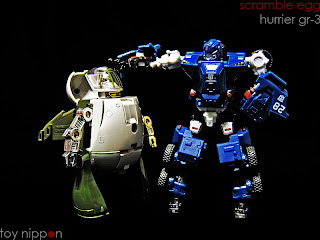 He's easy to transform and just fun to play with. These toys don't pop up very often, so if you happen to come across one in an auction and are even vaguely interested, don't pass it up. It might be a while before you see another one. I've been keeping my eyes open for the other two, F-16 Fighting Falcon and F-15 Eagle, and if you have them and are willing to part with them, let me know! 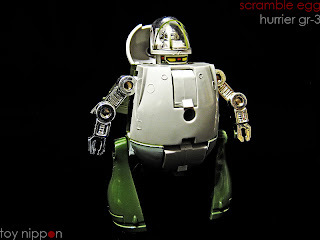 And if you like the chibi-esque, SD style of this toy, you may be interested in Toynami's Super Deformed Veritechs from a few years ago or Bandai's more recent SD Macross F VF-25F Messiah Alto Custom. I have both the green version you photographed and a bright yellow version of the "hurrier". They are definitely unique. I also have the F-16 "Egg" Falcon in it's original box if you're interested. It's just sitting in my attic looking for a good home and I'll gladly send it to you if you cover shipping. Email me at metalav8b@mindspring.com if interested. Thanks for the great write up/photos. Still have them? I'm seriously trying to get them for my childhood memories.